Tuberculosis was a massive scourge in the ancient world. Archaeologists have found evidence of TB in human remains as old as 7000 years. It is known to have been a big killer in ancient Egypt and ancient Greece and has killed billions of people during history. Estimates say that it has killed at least a billion people during the last 200 years of the 20th century. In Victorian England, TB was very common. It was often referred to as consumption or ‘wasting disease’ and was responsible for many premature deaths. Huge TB hospitals, sanatoriums were built and the main cure for TB was to take plenty of fresh air. Sanatoriums usually had large terraces where patients could be wheeled outside in their beds, even on freezing cold days, to breathe good air. This actually did no good at all, and it could easily have made them worse. However, the doctors at the time did not know this because the cause of TB was not discovered until 1882, when the great scientist Robert Koch showed that the bacterium Mycobacterium tuberculosis was responsible. The discovery of antibiotics in the 1940s and the subsequent development of the BCG vaccine against TB should have marked a sharp decline in TB. This did happen in the industrialised world for a time and, in the 1950s, scientists in the United States believed they were on the verge of eradicating TB. But then antibiotic resistance started to appear, and it was shown that the BCG vaccine was not very effective at preventing infection by M. tuberculosis. The rate of TB infection in the developing world continued to be high but then, in the 1980s, there was a sudden change, a change that led to the bacterium that causes TB winning its fight against modern medicine. When the AIDS epidemic began, the reduced immunity of people affected allowed TB to go on the rampage. Cases began rising at an alarming rate in the USA, and a similar increase was seen in Europe. The combination of HIV and antibiotic resistance led to a great upsurge in cases, that we are still struggling to control. In the poorest countries of the world, where there was never any TB control, by either a vaccine, or regular treatment with antibiotics, the situation got completely out of control. In 2006, there were an estimated 9 million new cases of TB worldwide, and almost 1.7 million people died of the disease. It is estimated that around a third of the worlds population currently has TB. 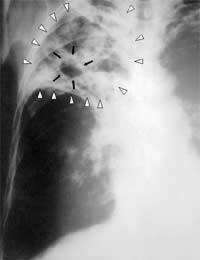 TB can be treated with antibiotic therapy – called the DOTS treatment. This is a long treatment that must be taken every day for between 6 and 24 months to stop the infection, and this is quite a difficult thing to achieve. The difficulties of TB infection in people living with HIV continues to be a major challenge, as anti-retroviral therapy for HIV cannot be given at the same time as DOTS, because the drugs interact adversely. In 2008 over $3 billion was spent in the global programme to control TB and countries all over the world, and major funding organisation such as the Bill and Melinda Gates Foundation have committed themselves to billions of dollars more to work against the impact of TB in the future.